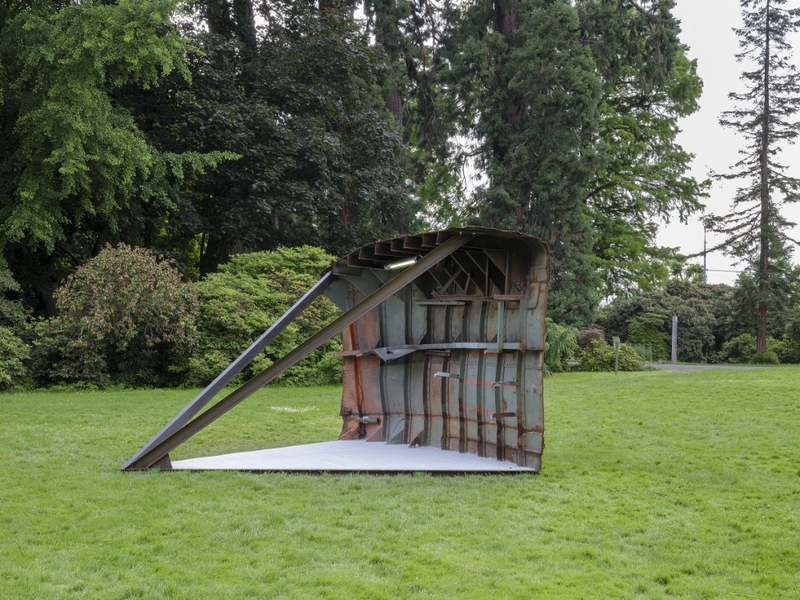 The Sculpture Biennale of Geneva is holding its first edition this summer, in the majestic Parc des Eaux-Vives. It follows on from the initiative of artgenève to present sculptures in public spaces, on Quai Wilson during the fair, and in this same park in the summer of 2016. For the artistic scene in Geneva, the objective is to provide a second date to be inscribed in the international calendar of contemporary art events and, for the public, it is a new free offer during the summer season. The exhibition has been conceived as a journey, an invitation for a stroll along the pathways of the park, while discovering contemporary artistic productions. They have been laid out as a series of encounters offered to the visitors, either in a dialogue with the landscape, or else in contrast with it, through the incursion of urban themes. One discovers, among other things, a giant mushroom and a bronze lightning-struck tree, as well as phone booths made over for another use and a flying saucer… 14 works inhabit, for a summer, the alleys and the pastures, the trees and the groves of the landscaped park Genevans appreciate so much. The organization committee of the exhibition wants this event to have an institutional and public dimension which is different from the premises that led to its conception. Thus, several works come from public collections and some projects have been specially produced for the occasion. Furthermore, performances enliven the entire duration of the event and offer forms that have more to do with the ephemeral than with monumental sculpture. A mediation program also allows those who want to delve further into the discoveries they have made during this journey. For more information, please visit the Art Geneve website.